What Does Returning Your Shopping Cart Have to Do With Cancer? 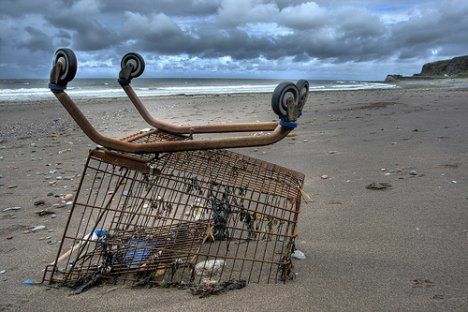 I’m often intrigued by the number of shopping carts that I see at my local grocery stores that have been dragged up and over curbs, left awkwardly in the parking stalls that would ordinarily hold a car, anchored in flower beds and shoved into twisted, abandoned clusters like so many rusted orphans. But mostly, I’m just confused. Because it’s not only discarded baskets that I’m talking about, but a simple task that almost everyone is faced with regularly, a duty so commonplace and seemingly unimportant that its significance may surprise you. It’s a responsibility that carries with it a crucial message and reveals at a profound level, how we live, what we believe and who we are. Before I go any further with this, let me say that I am guilty of having left a cart or two in the parking lot in my early days of shopping, though I think of myself now as a “converted cartie,” so I take responsibility for my past actions. The “rationalizer” inside of us is a cunning internal accomplice designed to protect us from being wrong. It’s this voice that cushions our ego and allows us to waver, if only for a moment, from the integrity that we owe ourselves and others. And it’s this very voice that pulls us away from our deepest commitment to surviving our cancer. We know when we shove that cart over the curb that something is not right. Our bodies are perfect lie detectors. When we fall away from our true nature, we contract. And those chemicals we feel as emotions are not conducive to health and healing. When we listen to our bodies, we are hearing either the melody of wellness or the static of illness. And those subtle, emotional cues are hiding inside all of the choices we make, in all that we believe and in everything that we do—even the seemingly small stuff. During my year-long residency at the Palolo Zen Center in Hawaii, I was diagnosed with male breast cancer. And it was there that I first became aware of the frequency of those moments in which my own body actually conversed with me. It took a cancer diagnosis to open my eyes and slow me down long enough to see that every action counts in my life. Nothing goes unnoticed by our psyche, our physical bodies or our immune system. When we eat poorly, drink too much, sabotage our friendships, defy our beliefs or leave our shopping cart in the parking lot (the list goes on and on) we create an atmosphere for negativity—possibly inviting sickness to grow. When you boil it all down, this shopping cart issue is really about simply being aware of that powerful, unseen teacher that dwells within each of us. You might call it your conscience or your spirit or the still, small voice. Surviving cancer demands that we be attentive, in every minute and in everything we do. The idea of living in the present moment is an old one. It’s a cliché that is hard to grasp by virtue of its simplicity. But at that very instant, there in the parking lot as we are faced with rushing home to make dinner for a hungry family or feeling tired and irritable from a day of shopping, we have a perfect opportunity take a brief minute out of our very busy lives to slow up a bit, breathe one more breath of life, and walk silently and authentically with our cancer—back to the little stall where the carts are stored and waiting.